Nearly 300 schoolgirls kidnapped in Nigeria by Boko Haram militants could be released in exchange for jailed comrades, a former Boko Haram negotiator has reportedly said. A former mediator of the group has told the Telegraph he believes the video, where Boko Haram leader Abubakar Shekau threatens to sell the girls as slaves, shows he plans to use them as ‘bargaining chips’ rather than kill them. 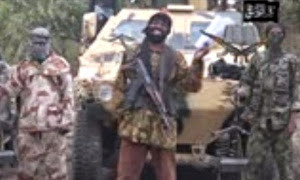 Shekau claimed responsibility on Monday for the abduction of more than 200 schoolgirls during a raid in the village of Chibok in northeast Nigeria last month. Shehu Sani says he believes that the footage, released on Monday, was an attempt to persuade the Nigerian government into a prisoner trade. He told the newspaper: ‘From my knowledge of the group, to have him saying that he will sell them is proof that this issue can be resolved.